"Unless we believe that those who have more are inherently superior to those who have less, we should be troubled by the fact that patterns of achievement are often fairly predictable, particularly with respect to students' race and class." 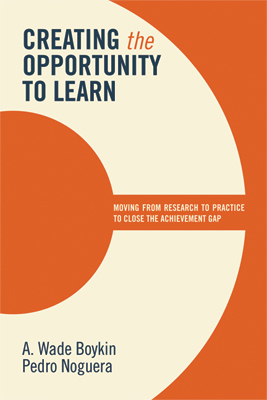 In Creating the Opportunity to Learn, Wade Boykin and Pedro Noguera help navigate the turbid waters of evidence-based methodologies and chart a course toward closing (and eliminating) the academic achievement gap. Turning a critical eye to current and recent research, the authors present a comprehensive view of the achievement gap and advocate for strategies that contribute to the success of all children. If we want to bring about significant improvements in those outcomes, we have to do more to address the context in which learning takes place. In short, we must create schools where a child’s race or class is no longer a predictor for how well he or she might perform. "As education researchers well versed in speaking to communities, Boykin and Noguera's Creating the Opportunity to Learn makes for a pleasant and informative read that accurately builds the bridge between the research to educators." coach, and data analyst, New York, N.Y.
A. WADE BOYKIN is a professor and director of the graduate program in the Department of Psychology at Howard University. He is also the executive director of the Capstone Institute at Howard University, formally known as the Center for Research on the Education of Students Placed At Risk. Dr. Boykin has done extensive work in the area of research methodology; the interface of culture, context, motivation, and cognition; black child development; and academic achievement in the American social context. He is coeditor of Research Directions of Black Psychologists, which was a finalist for the American Psychological Association’s Book of the Year. PEDRO A. NOGUERA, Ph.D., is the Peter L. Agnew Professor of Education at New York University. He holds tenured faculty appointments in the departments of Teaching and Learning and Humanities and Social Sciences at the Steinhardt School of Culture, Education and Development and in the Department of Sociology at New York University. He is also the executive director of the Metropolitan Center for Urban Education and the codirector of the Institute for the Study of Globalization and Education in Metropolitan Settings.